The history of oil pastels is short and colorful. Like acrylic painting, it's an invention of the twentieth century. Many good examples can be found in museums of modern art, as it's one of the new mediums that Pablo Picasso pioneered. Though the medium didn't exist earlier than the 20th century, its roots go back a lot deeper. OP is related to 2,000 year old encaustics (painting with melted wax). Oil pastels first appeared with Sakura Cray-Pas in 1925. The name comes from Sakura’s bold invention of combining nontoxic crayons and pastels. Eliminate the dust but keep the strong colors and opaque intensity of traditional soft pastels. Today, Cray-Pas are available in “Specialist” artist grade firm square wrapped sticks and a less expensive student grade “Expressionist” line. Both have colorless blenders. Talens of Holland introduced Panda Pastels in 1930. Modern artists enjoyed the freedom of drawing or painting on any available surface, but some of them missed the opaque brilliance of traditional pigments like Cadmium and Cobalt. Still, this medium was considered a children’s product. I haven’t found Panda Pastels anywhere. In 1949 Henri Sennelier, heir to a family paint company founded in 1887, created a fine art product for Pablo Picasso and Henri Goetz. Goetz wanted to sketch under oil paintings. Picasso wanted professional quality pigments in soft sticks that could be used on any support that came under his talented hands -- wood, glass, corrugated cardboard, paper, canvas, ceramic. Senneliers come in sets up to 120 and a 48 color New Colors set as well as open stock. They are the softest artist grade ones with a texture like painting with lipstick. Cadmium colors, Cobalts and other toxic pigments are clearly marked on the wrapper. The color range includes some subtle grays and neutrals favored by Picasso along with many gorgeous blues and reds. Caran d’Ache introduced artist grade Neopastels in 1965 and changed the sticks in 1981 to smaller, more easily handled oil pastels. These are available in 96 colors. They also created other artist crayons, Neocolor I (firm) and the rich soft watersoluble Neocolor II. Neopastels are medium-soft, more firm than Holbein and Sennelier but softer than Sakura Cray-pas. They are lightfast and nontoxic in all lines. Holbein created an artist grade line in the early 1980s with 45 hues and a total of 225 colors. Holbeins have four tints of each pigment, allowing a new ease of shading and precise control of tints. Holbeins are a little messy because they don’t have wrappers, but they are nearly as soft as Senneliers. Some pigments are toxic and should be handled carefully, the Cadmiums and Cobalt sticks use original artist pigments. Holbein also produces an academic line that's less expensive, firmer and less pigment-saturated. The round sticks are wrapped and easy to distinguish from artist grade Holbeins. Sometime after 1990, a new artist grade product appeared. Erengi Art Aspirer is available from Jerry’s Artarama. Shaped and sized like Neopastels, these come in a range of 92 including a colorless extender, metallics and fluorescents. Nearly as soft as Neopastels, the inexpensive Erengi have become the workhorse of my palette, especially for covering broad areas when I'd rather not use up my Neopastels. I haven’t found any history on Van Gogh’s Extra Fine Artist oil pastels, but these are firm sticks comparable to Sakura Cray-Pas specialists and reasonably inexpensive. Pigments are listed. Cretacolor Aqua Stic watersoluble oil pastels have a texture very close to Erengi Art Aspirer, right in the medium-soft range. I’m not sure when these were invented, but it’s recent. They aren’t mentioned in Kenneth Leslie’s Oil Pastel: Materials and Techniques for Today’s Artists, which is my main source for these historical details. The long narrow Cretacolor sticks are watersoluble, avoiding the problem of toxic thinners, and their proprietary binder blends well with other oil pastels. With an 80 color range in a variety of sets, these are a good medium-price alternative for fine artists, especially those who have any reaction to turpentine, odorless turps and other oil painting mediums. With a renewed movement toward representative art in the 21st century, many artists are discovering new ways to create realism and impressionism. Here's some proof the medium's not limited to large scale or loose rendering. 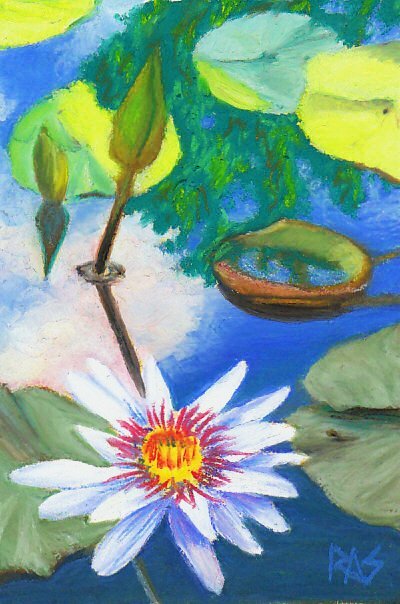 Water Lily Pond is a painting I created using 12 Neopastels.